Memphis punk rockers Oblivians disbanded way back in the '90s, releasing their most recent album, …Play 9 Songs with Mr. Quintron, way back in 1997. Having recently reformed, the band will release their long-awaited fourth album on May 28 with Desperation. It will come out through In the Red Records. These 14 songs reportedly channel the band's classic sound and draw on '50s rock'n'roll and Memphis soul. They incorporate the band's usual mix of garage rock, blues and punk, and the record also includes a cover of a Cajun zydeco tune. Between our last record as a band in '97 and now, a lot of water has passed below that bridge. We three went our own ways after that and pursued our own musical goals. Personally, I often missed the dynamic that Jack and Eric offered to my songwriting. Almost as much as I missed being given carte blanche to add a thing or two to theirs. I've played with lots of great musicians in the interim but needless to say, it's a hard itch to scratch. The dynamic between us was a singular thing. So, over the years as we would occasionally reunite for a festival or special occasion, the idea began to grow in the back of my mind — the idea of making a new record. I mean, if you're going to keep playing as a band eventually you'll want new songs to play. Because as much as we enjoyed playing together the thing I missed the most was creating together. So that's what we did. Although the announcement says nothing about where the album was recorded, a Nashville Scene report from last spring hinted that the band were working on recordings with Dan Auerbach of the Black Keys. Cartwright previously played with Auerbach on an album with the Parting Gifts. 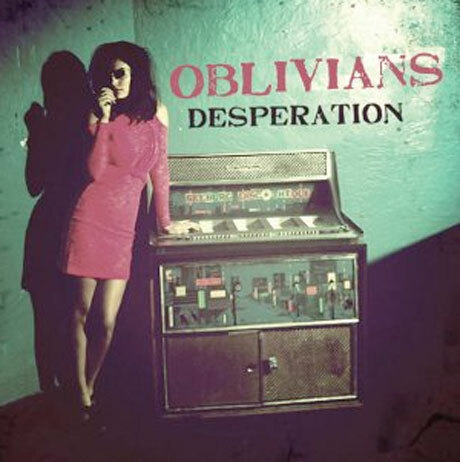 Desperation will be available on LP and CD, and that's the cover above. However, the tracklist has yet to be revealed.